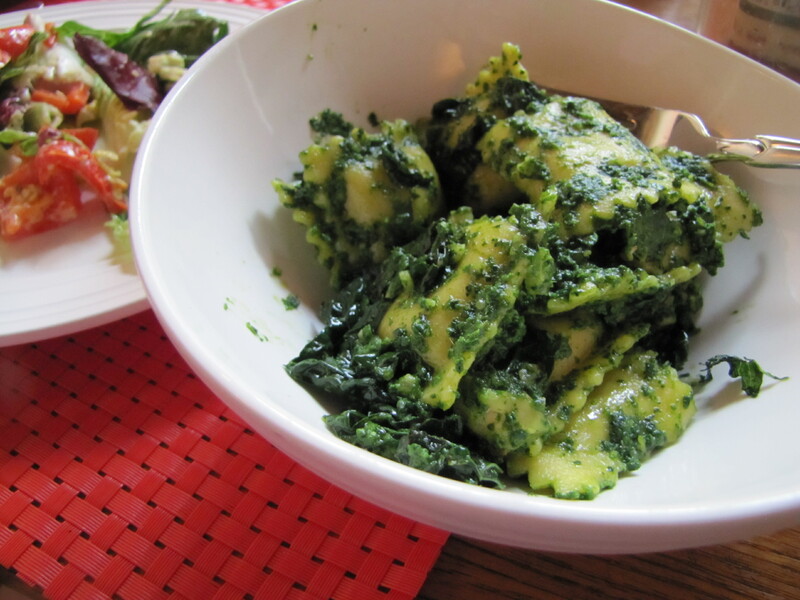 Kale Basil Pesto Ravioli with Sauteed Kale – Voila! There are many bases to cover: first, the Whole Foods brand ravioli is awesome. We tried the basil parmesan and mushroom medley. This is not a paid advertisement, just a small town food blogger telling you what’s real. Second, adding fresh sauteed kale to ravioli not only boosts the nutrition of the dish, it boosts the flavor! Finally, when basil is expensive to buy in bulk at the market, combining basil with kale is a great (cost effective and tasty) solution. Maybe I should rename this “kasil” pesto! Another Voila! favorite: roasted red peppers in caesar salad. Yum! 1. Rinse kale and cut leafs off the stem. In small bunches, julienne then chop kale. Place in large bowl. 2. 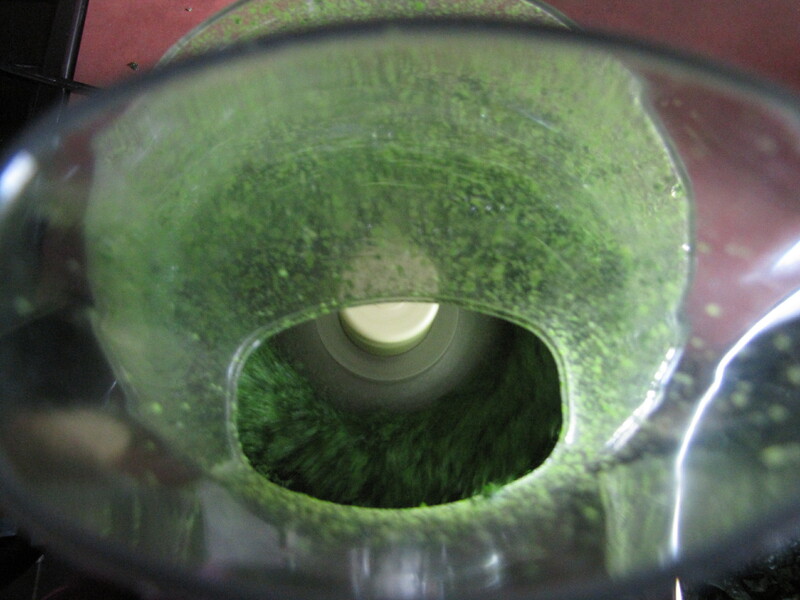 In the bowl of a food processor, place kale (this might happen in sections since there will be a lot of kale), basil, 4 garlic cloves, salt, pepper, sugar, red pepper flakes. Process, scraping down sides as necessary. Add all the kale except 2-3 cups. Once all the kale has been added, add walnuts. Then drizzle in olive oil with the blade running. Add parmesan. Process again until combined. Taste and adjust seasonings as necessary. Move pesto into mircowave safe bowl. 3. Start boiling waiter for ravioli (cook according to package) and prepare sauteed kale. 4. Heat 1 tablespoon of olive oil over medium heat in skillet. Mince two garlic cloves and add to skillet, cook for about 30 seconds. Add remaining kale and toss with olive oil and garlic. Add pinch of salt and pepper. Add splash of water and cover with lid for 2 minutes. Toss kale and taste for doneness and taste. Remove from heat and keep lid on. 5. When ravioli is done, warm up pesto in microwave for 1 minute. Drain ravioli and return to cooking pot. Add 1/3-1/2 cup pesto (eyeball proportions) and all of the sauteed kale. Serve!